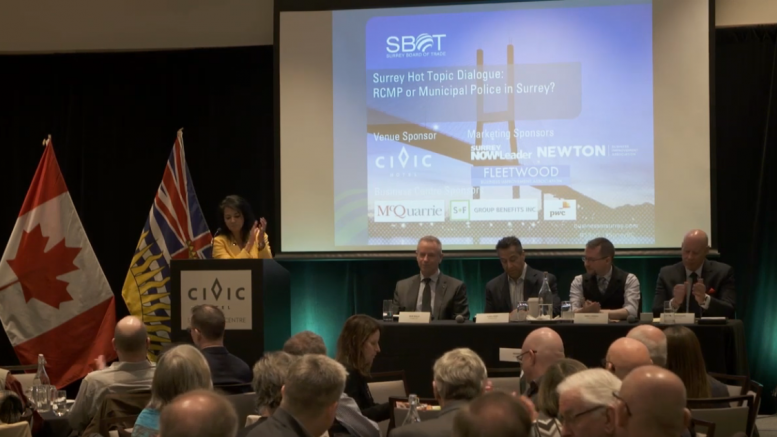 Surrey – On Tuesday, the Surrey Board of Trade hosted a dialogue, RCMP or Municipal Police in Surrey? The City of Surrey is looking at transitioning to a municipal police force from the current RCMP. This was an election promise from then candidate and now Mayor Doug McCallum among others. In the 90’s Abbotsford, Matsqui and Clearbrook had a similar discussion when amalgamation took place. Abbotsford Mayor Henry Braun has reminded Surrey about their discussions when APD took over from the RCMP and the challenges that ensued. Just to let you know that this was a dialogue – not only about the RCMP or a Municipal Police Force in Surrey – but about a holistic approach towards public safety in Surrey – the cost to taxpayers to both residents and businesses – the benefits of both approaches – the need for public engagement and a healthy/respectful dialogue for decision making. The question is what will enhance livability and economic development in Surrey. The Surrey Board of Trade took a leadership approach to encourage dialogue. Our hope is to ensure that decision makers are willing to hear from you today – to hear your ideas & perspectives – this is public engagement. This is the first Surrey Hot Topic Series dialogue of 2019 – our lineup of events is an interconnected series that covers issues vital to business attraction and business support. The Surrey Board of Trade’s next Surrey Hot Topic focuses on Cyber Crime on March 12th from 7:30am-9:30am at the Civic Hotel. Be the first to comment on "Surrey Hot Topic Dialogue: RCMP or Municipal Police in Surrey? (VIDEO)"